Contents. List of Contributors. Preface (E.E. Bittar and N. Bittar). The Thymus in Immunity (J.F.A.P. Miller). The ß-Cell in Immunity (D. Tarlinton). Cell-to-Cell Interactions in the Immune System (W.A. Sewell and R. Penny). Immunological Tolerance (J.F.A.P. Miller). The Generation of Diversity in the Immune System (E.J. Steele and H.S. Rothenfluh). The Antigen-Antibody Complex: Structure and Recognition (P.M. Colman). The Major Histocompatibility Complex (B.D. Tait). ß and T Cell Signaling at the Molecular Level (T. Mustelin and P. Burn). Cytokines in Immunology (A.J. Hapel and S.R. McColl). Activation and Control of the Complement System (B.P. Morgan). Phagocytes in Immunity and Inflammation (P.M. Murphy). Anaphylaxis (C.Prussin and M. Kaliner). Autoimmunity and Atutoimmune Disease (S.K. Bhatia and N.R. Rose). Cell Death and the Immune System (R.M. Kluck and J.W. Halliday). Designer Antibodies (A. Minn and J. Quintans). Psychoneuroimmunology (R.M. Benca). Index. 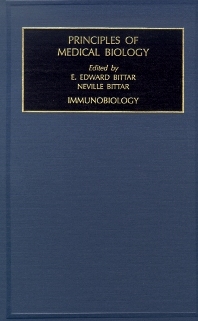 As this volume demonstrates, immunobiology is a young science which is undergoing explosive growth. Judged by results, it is already an elaborate discipline which cuts across every other area in biomedical research and even has its own vocabolary (e.g., the "veto" effect). Rather than inculcate the habit of superficial learning by having the student go through a maze of details, we have sought to gather together sixteen essays that range from T-cells to psyhoneuroimmunology. This is keeping with the growing understanding that the student is expected to read and think far more for herself/himself. Next to nothing is known about innate immunity. However, recent evidence suggests that collectins might bridge the gap between innate immunity and specific clonal immune responses. Collectins are soluble effector proteins that include serum mannose-binding protein, and lung surfactants A and D. They are considered to be ante-antibodies.